Delhi University (DU) First Cutoff 2016 – University of Delhi has announced DU 2016 First Cutoff on June 29, 2016 (8:30 pm). Ramjas College, this year, has declared the higest cutoff marks for admissions to B.Com (H) programme at 99.25 per cent. Shri Ram College of Commerce (SRCC), one of the most sought after colleges has announced the 1st cutoff marks for DU 2016 admission at 98.25% and 98% for B.Com (H) and BA (H) Economics programmes, respectively. The first cutoff of DU 2016 has been announced in online as well as offline modes and the associated colleges of Delhi University are to offer admissions to various programmes at par the announcement of first cutoff of DU 2016. 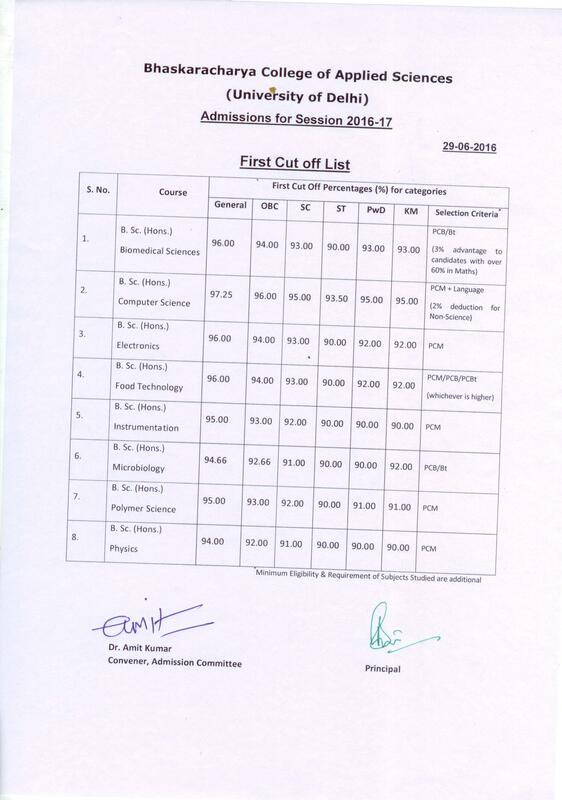 DU First Cutoff 2016 has been announced by colleges of DU 2016 for admission to each of the offered programme. The list below will provide you an overview of the first cutoff as announced by different colleges for DU 2016 Admission. First Admission list 30 Jun 2016 – Announced! IV PROOF OF HAVING STUDIED HINDI TILL CLASS 8TH. VIII OBC : INCOME CERTIFICATES SHOULD BE ISSUED ON/ AFTER JANUARY 1, 2016. IX TRANSFER CERTIFICATE FROM SCHOOL/COLLEGE AS WELL AS MIGRATION CERTIFICATE FROM BOARD/UNIVERSITY FOR THOSE WHO HAVE PASSED SECONDARY FROM OUTSIDE DELHI. above information developed by Trilok Singh. Due to DU server issue. Next article Debates Around Uniform Civil Code? Why are elections in the DU so important to political parties? Debates Around Uniform Civil Code?